“To every thing there is a season, and a time to every purpose under the heaven” is a passage from the Bible – Book of Ecclesiastes (3:1) and also part of the lyrics to the Turn, Turn, Turn song made famous in 1965 by the music group – The Byrds. We live and die by the seasons. Our lives revolve around them as the Earth does the sun. So, it stands to reason that there are certain things that we tend to do in certain seasons. Its mid-February as I write this. I’m sitting outside in a protected area on the first unseasonably warm day we have had this winter, watching the snow melt. The sun on my face and the sight of grass peeking through the snow makes me think of lawn and garden tasks I need to do. If it’s February, it must be time to prune the fruit trees! Here are gardening related tasks I do in February to get ready for the coming spring. 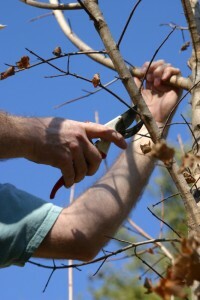 Tomorrow, forecasted to again be in the 50’s temperature wise, will be fruit tree pruning day. Fruit trees need to be pruned while dormant and I prefer to do it around mid-February, weather permitting. I have two apple, one cherry and one peach tree. I’m still learning how to prune – which isn’t intuitive to me, even after studying and reading how to do it. This year I’m going to try a severe pruning as my ‘dwarf’ Lodi apple tree is getting way too tall as is my peach. None of the trees have produced much fruit in the 5 years since I planted them. Maybe a good pruning will help! My fruit trees are susceptible to a fungus or bug that makes the leaves turn red and die. I have found that if I spray in February, before things start growing, I kill off whatever it is that is causing the issue, so I’ll do that after I prune, apply true paint and cut up the pruned branches on the compost heap. Enrich the soil with additives. Hubby likes to apply nutrients to the soil , as well as additives that break up our clay – in areas he is planning new plantings. Putting them down now allows any further snowfalls to really soak them into the soil, plus it gives him an excuse to get outside and away from the cabin for awhile! Cabin fever is a real disease for him. Cut down ornamental grasses to make way for new growth. We live on the edge of the prairie and have planted native garden plants such as ornamental grasses. They are beautiful against the winter sky – some as tall as 15 feet with large grass head plumes that wave in the breezes. However, soon the new grass shoots will be trying to thrust their way up and the old foliage needs to go. It can be quite a time consuming task as we have lots of grasses. We have a lot of trees in our yard and have cut walking trails through our woods. During winter, the storms rake dead branches from the trees and litter the ground. As the snow melts, they are uncovered. Getting out on clement days to pick up the sticks gives a bit of exercise and clears the way for spring lawn fertilizing. I also get a bucket and pick up the gravel that the snowblower re-positioned onto the lawn! Give dormant houseplants light and water. In a week or so, it will be time to bring the Amaryllis plants into the sun-room. They need to have several months of dark, cool conditions to go dormant. If they don’t go dormant they won’t bloom. Check out the full story at the United States National Arboretum. Watch for signs of spring! Around here, the earliest of the spring flower bulbs start popping up in March. The tiny Crocus and the native Daffodils are usually the first to poke their tiny green stalks through the snow and winter muck in the woods. A few weeks later and they will be blooming once again! The snow is finally melting around here and we’re getting a good look at our new yard. We’ve also got flowers coming up in the beds already. I cannot wait for spring this year! We’re going to plant our first vegetable garden ever. One mistake many new homeowners make is to forget that the prior hoomeowner may have loads of beautiful (and expensive) plantings already in the yard. Looking forward to planting that new garden is great! Have fun, but be aware that there might already be something waiting in the ground. I don’t have a yard, but I do keep a pot of basil on my windowsill which desperately needs to be replanted. Yum, fresh herbs – good for you. We have been under a snowpack since January, so I have not been able to do anything at all. Usually by mid-March, the first batch of lawn fertilizer is starting to get applied, and I like to spray around the perimeter of the house for bugs. I might still try to do that, as there’s a couple of feet around the house that seems to be snow free. I hear you. We’ve been on a see-saw here in the Midwest – negative temps with snow and ice one week, sixties and seventies the next! Spring WILL come again. I just saw a Robin the other day, so I know it’s time to start preparing for spring. I need to start figuring out the layout of the garden, which veggies I need to plant first, and rake up all the old leaves and branches. I’m definitely ready for this winter to be over! I used to think that Robins were just around here in the warmer weather, but the last few years, we’ve seen them all winter. I don’t know how they are finding bugs to eat in the really cold weather!